Today’s recruitment market is more competitive than ever in the UK. The effects of the financial downturn have resulted in the ageing population being faced with a reduced number of senior jobs and more graduates competing for entry level roles. The CV is one of the two most important short documents of your career, it can make it, or it can break it. You should take the time to invest in it and perfect it, but to do that, it is important to know what good looks like. In this Ebook we will provide an overview of what our clients really want, with direct quotes and a summary for your usage. A CV should provide enough details to provide a taster of the candidate with proven evidence and experience, but not too much detail. As well as past experiences, it should include relevant qualifications and as many achievement as possible. Another important aspect is work history and education, again relevant to the role you’re applying for. 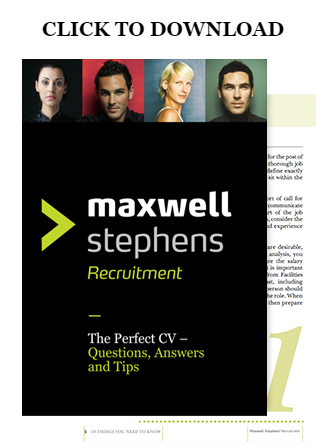 Ensure your CV is clear and concise and proof read that your document is relevant, avoiding contradictions and irrelevant statements. If you are applying for a role in a different industry or sector, consider your audience and remove industry specific jargon. Focus on tangibles such as time, quality and cost. These are understood by every reader, regardless of industry background. And of course, don’t forget your contact details!